SoundLok™ THE NEXT GENERATION OF SOUND-ISOLATION PRACTICE ROOMS. University of Iowa, Iowa City, Iowa THERE'S SOMETHING IN THEM FOR EVERYONE. Architects and Project Planners Music Educators and School Administrators Musicians and Vocalists SoundLok has a GUARANTEED NIC RATING SoundLok provides adequate and effective music practice space for more students. SoundLok rooms provide a private and effective space to practice without hearing the musician in the next room. Improved lighting Save time! SoundLok rooms don't require you to spec and research all the components necessary to achieve the proper levels of sound isolation. Budget friendly. A SoundLok room installs for a comparable price to a stick built room. SoundLok's modular design is easy to install, and can relocate if necessary. SoundLok has a GUARANTEED NIC RATING SoundLok rooms are well built and aesthetically pleasing. Wenger's VAE technology adds amazing functionality to the SoundLok room. Record and playback enhances learning and can be used for evaluations. SoundLok rooms are modular and relocatable. 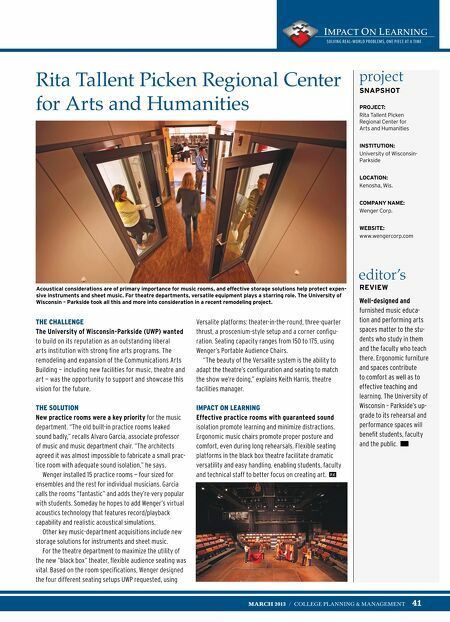 Improved door acoustics Improved fit and finish throughout More color choices Optional metronome and tuner Proper absorption and diffusion of sound makes for more effective practice. Wenger's VAE technology can turn the acoustics of a SoundLok room into nine different environments – from a recital hall to a cathedral. Students can even upload accompaniments, record and playback their sessions. 800-4WEN G ER (493-6437) • www.wengercorp.com/soundlok Optional computer shelf You won't believe your ears! 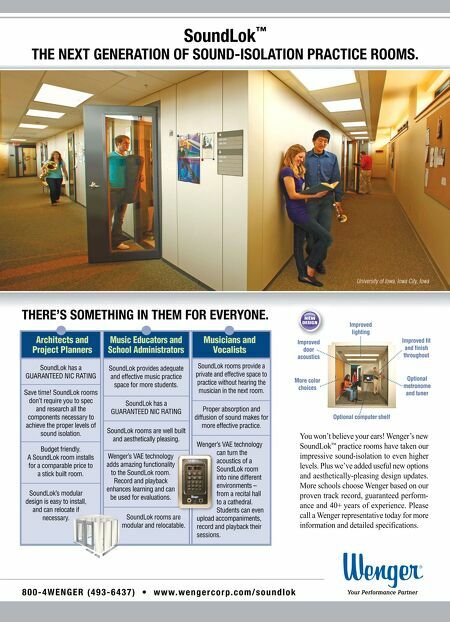 Wenger's new SoundLok™ practice rooms have taken our impressive sound-isolation to even higher levels. Plus we've added useful new options and aesthetically-pleasing design updates. More schools choose Wenger based on our proven track record, guaranteed performance and 40+ years of experience. Please call a Wenger representative today for more information and detailed specifications.